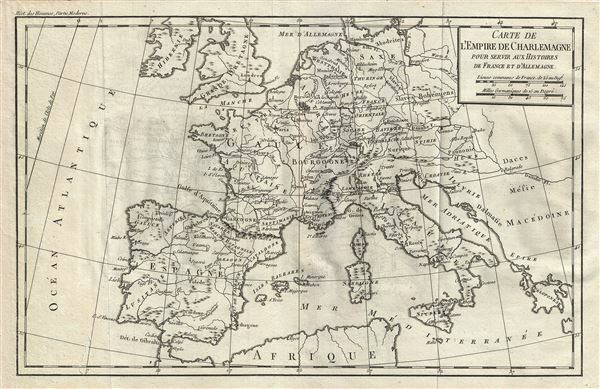 Carte de l'Empire de Charlemagne pour servir aux Histoires de France et d'Allemagne. This is a beautiful example of the 1770 Jean- Baptiste-Claude Delisle de Sales' map of the Empire of Charlemagne. It covers Europe and the European Empire of Charles the Great from Ireland south as far as northern Africa and from Portugal to the Adriatic Sea in the east. The map is highly detailed, noting several towns, rivers, islands and other topographical details. Forests and mountains are beautifully rendered in profile.